Pete Plain, an awkward but creative boy from a broken home, receives a powerful but illegal comic book to hide. After a devious bully shoots his best friend Jack with toxic slime, Pete takes a peek at the book and gets drawn into a different world. There he goes on an incredible adventure. When Jack discovers what Pete has done, he takes the book away. As Pete schemes to get it back, the evil forces that haunt his hometown cause division in his family. The comic book author gives Pete special powers for defeating enemies, but before he can fully realize those powers, he must first conquer the most sinister foe of all, the bitter malady known as Sadly Absent Dad Syndrome. C.R. Flamingbush grew up in Wheaton, Illinois and graduated from Georgetown University with a degree in German and linguistics. After working seven years for the Department of Defense (an easy job), she took on the most difficult challenge in the world: a lifetime career of raising four children. 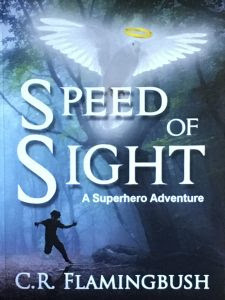 Along the way she developed a passion for writing Christian superhero fantasy. She enjoys humor because it's Biblical (see the second psalm) and she loves to make people laugh - whether through her writings, her art, or just by being herself. Writing fantasy is her way of poking fun at human foibles and all the ridiculous ideas that so easily beset the human race, while at the same time honoring God in every way she can. Flamingbush has been a member of Faithwriters since 2010, and several of her winning contest entries have been published by Fresh Air Press. She likes Fan Story and has been a Narnia fan since the age of ten. In terms of influence, she aspires to be the next C.S. Lewis but has quite a ways to go in that regard. Speed of Sight, a Superhero Adventure, is her first novel. A sequel is in the works. "This book wasn’t quite what I was expecting. I’m not saying it wasn’t good, it just wasn’t great. I was coming into this book expecting to read about a boy who finds a forbidden comic book, and is granted superpowers from said comic, along with the forces of evil trying to steal it away that they might use it for their own despicable purposes. This book was not like that. It was about a kid reading some outlawed comics, something with slime (which was not necessary or done in a way that was appealing to me), and him dealing with some emotional problems. Once again it wasn’t bad, I just wasn't impressed. However, I would still be interested in reading a potential sequel if it came out. I recommend this book if you enjoy slightly wackier superheroes than those you will find from other sources. It gets three stars in my opinion." I received a copy of this book courtesy of the author and Book Crash. I was not asked to write a positive review and all opinions are my own.